The Country Formally Known as The United States of America…. 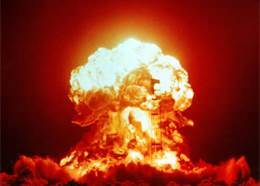 Did the Pope just give the sovereignty of the United States to the U.N.? Sounded like it to me. He endorsed the U.N. as being the official world “rule of law” and proclaimed that NO nation would be above any other, and that every citizen upon the planet had a RIGHT to an education, a house, a job, a religion, but only if they surrender to putting the ‘earth’ first and foremost. AND…the U.N. should control the economies, (and the world basically) and everything should be done for the ‘common’ good. Yes, a communist man, from a communist country, wants a communist world. Did he get this permission from Congress yesterday to hand over our sovereignty in the name of ‘saving’ the planet? Is THAT why John Bonehead resigned today? Did the Chinese government just take over the United States? While our Presidents have been getting us all bound up in the Middle East, China as slowly been moving it’s chest pieces into place to take over as the leaders of the world and the U.N. Ha ha ha ha! Obama didn’t see THAT coming did he? You could tell at the press conference today that Obama and John Kerry had been really “screwed” in some deal by the Chinese by the looks on their faces. I’ve personally never seen them so pissed off. John Kerry was sitting in the front row with his arms crossed, mad. Obama was…MAD. Oh sure, their speeches were “blah. blah, China is on board with climate change” but something happened. On top of that, yesterday, Xi Jinping met with top executives from Honeywell, Boeing, Cisco Systems, IBM, Starbucks, as well as Chinese firms Alibaba, Lenovo and Baidu. 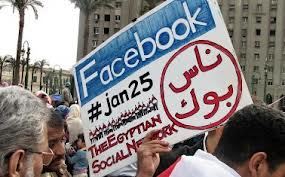 Facebook, Twitter, and Google were not invited. Tonight at a big party at the White House, he is meeting with Hollywood—Disney, Spielberg, and Netflix. I guess when it comes to money, you can scrifice a few hundred million for the chance at 4 billion. It’s all about the numbers. China, is basically calling all the shots. After that last cyber attack where China took down our whole govenment apparatus, I guess they now can control just about everyone. So, who will get to control the United States? Mexico? Saudi Arabia? or China? Is this Friday the 13th? Somebody check. I think they marked the calendar wrong. I know one thing for sure, I will never forget THIS day in history. To me, it was the final quiet submission of a great country…to foreign nations. By the way…they forgot to make room for Russia. At the local news hour tonight, I was watching public broadcasting, and there was an interview with Hank Paulson and Robert Rubin, (both X-U.S. Treasury Secretaries/Goldmen Sachs Presidents) being held in that global hotbed of one world government: The Council of Foreign Relations of which Rubin is now the head of. It seems our elites in the government are on another role to include China in the upcoming TPA deal, which of course— has a few hurdles. China could eventually join the trade pact currently under negotiation with 12 Pacific nations, President Barack Obama said Wednesday. What Paulson and Rubin want…is China to build its factories HERE so that the American people can be employed. 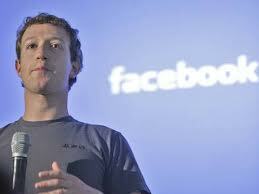 They are hoping in return that China will open up more markets to the big multinationals in China. But…there’s a catch: China insists that we build up our infrastructure. And so, both Paulson and Rubin said Americans need to pay higher taxes to do that. Yes. It’s necessary. We must invest in our infrastructure so China can come build its factories here. Which means, China will get a free pass on opening its factories here, while the regular Nobody American will not. He will have to pay double the price. Add that to Jeb Bush letting us know, that he would raise the Social Security to age 70, and you have a double whammy coming your way. Never-mind that the government stole that money from your paycheck in the FIRST place, without you having any choice in the matter, they spent it, and despite all the trillions of dollars that THEY have wasted of your money, they have no intention of letting you get your measly little SS paycheck back. They want you to keep working. They need more…in order to keep their stock portfolio’s strong. And if you just pay MORE money to them to build new roads and airports for China, I’m sure that China will come in, and give you a nice job at 70 to make all the products you can get at Wal-Mart! It’s a win/win! 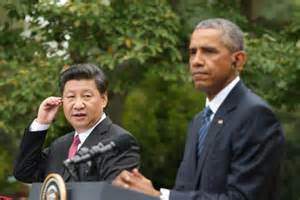 You will get to work 7 more years, and America can become a subsidiary of China! This has been the plan all along…One big multinational global government world. This video was taken in 2012. 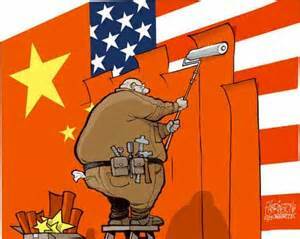 Nobody Wins-–when China and America merge into one big fascist FUBAR…and…are you mad yet? Tell me: Is fraud still a crime in America? Nobody Knows, and I say this because of one word: Gruber. Yes, a man named Jonathan Gruber actually enlightened us this week. As Americans have been forced to stand around in wide-eyed ignorance every day since Obama was elected— this week, we actually got a GRUBER to admit to how stupid he thinks the American people are, because he wrote Obamacare in such complicated legalize nobody would figure out what a scam it was. Yes, it was Gruber: the man who designed the “Affordable” Health Care Act for America, who deliberately deceived us all and admitted it! A man who thought nobody would notice when he told the truth— Oops. A few too many cocktails….it just slipped out. But—- he’s GLAD he lied. While most nobodies in the country would probably do at least 10 years in jail for committing fraud, not GRUBER! He was just doing what Obama wanted. He has sort of apologized, but so far, our President has not. And now, because Obama’s skin in BLACK— we can all go back to the usual state of the union with a President who hides, lies, cheats, and denies everything. Obama promised the most transparent administration and rule of law to ever grace the Lincoln bedroom. So far…all we really know is…Lincoln is still dead. 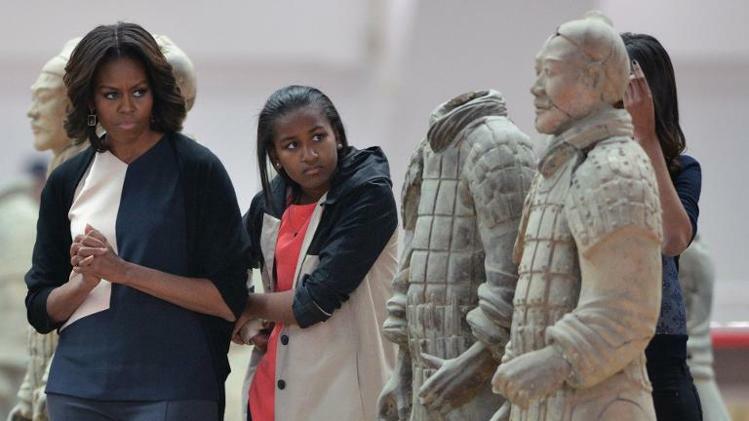 Nobody Knows what the heck Obama is doing in China besides chewing gum. Word has come out that China is making fun of Obama, and didn’t take too kindly to his chewing gum. As he strolled out chewing from his limo…somewhere Gwyneth Paltrow was fainting while looking for a pack of Juicy Fruit. While Putin was acting like he was the life of the party, Obama acted like he had been dragged off the 17th hole, and was being made to listen to a Merle Haggard concert. 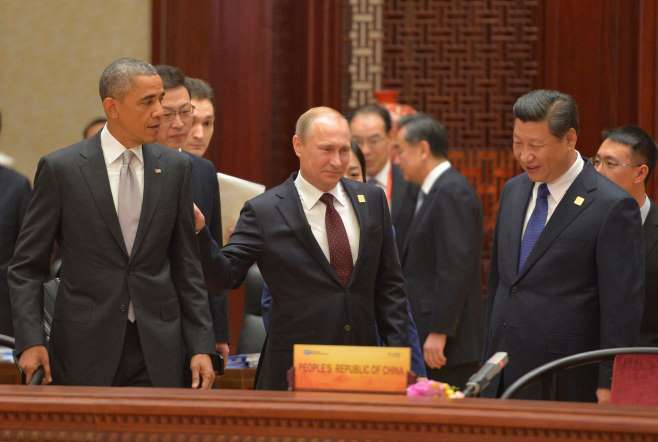 Putin got great energy contracts with China…What did Obama get? Nobody REALLY Knows. Remember, he told us we could keep our doctors…. They are going to be working overtime soon in Ferguson, because today, Governor Nixon came out and declared to the world that when it’s announced that officer Wilson is NOT guilty of shooting Michael Brown, people are going to be fighting over those nifty Michael Brown tee-shirts. The family of Michele Brown is fighting over who gets the money for those tee-shirts now. 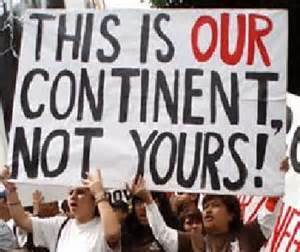 In fact, they are so mad, they went to Switzerland to protest to the United Nations to get the U.N. to prosecute (not sure who) the police for torturing their son. They are demanding “global intervention.” They want to announce to the whole world that America is a racist, no-good, bigoted country and they torture black people. Okay, so maybe Obama said that…but do check out that tie…. Right: Christians are being slaughtered, all over the world, blacks are being slaughtered by BLACKS here in the U.S., but let’s tell the world that if a cop shots a thug in America, one that is trying to kill him….only the U.N. can save us. Nobody knows how many people are being tortured by having to listen to this nonsense, but I digress…Michael is dead. And Nobody Knows just how much money Michael’s parents are going to make in merchandising the BRANDing of their son, in order to become rich enough to retire OUTSIDE of Ferguson…probably Martha’s Vineyard. He LIKES his wonderful job, and all its perks—- Private Jet, fancy dinners, and as you can see by this picture he took and tweeted: Ladies butts. BUT…whoa. Wait! The Republican took over the Senate! Missouri Governor Jay Nixon said on Tuesday the National Guard would be on standby to respond to any violence after a grand jury decides whether or not to indict a white police officer for shooting dead an unarmed black teenager in Ferguson. “That ugliness was not representative of Missouri and it cannot be repeated,” Nixon said. “These measures are not being taken because we are convinced that violence will occur, but because we have a responsibility to prepare for any contingency,” he said. Nobody Knows what caused Nixon’s 180-degree turn around, but my guess is he would like to keep having big butts on that private jet of his. Not that I have anything against big butts…just governors who tweet them, and flip-flop on their ‘beliefs.’ At least Nixon is transparent: We all can SEE him for what he is— a politician now afraid of losing his job. So again, another week where the nobodies of the world are kept in the dark: Nobody can figure out what’s coming: Will Jeb Bush and Hillary run for President and there will be a tie? Will Daddy Bush die while Obama is still in office? And more importantly, would a politician die just to get his other son elected? Is Sarah Palin going to run in 2016? Bernie Sanders? Christ Christie? Mitt Romney? Rand Paul? The Examiner: Reporters say that they have been blocked from events, screamed at by officials, held back with red tape and told not to move from prepositioned lookouts, possibly to avoid taking embarrassing photos. 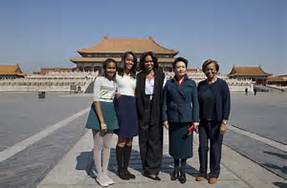 On Monday, the New York Times filed a pool report about the first lady’s tour of Xi’an, a city dating to the 14th century. “Event below marred for press by obnoxious Chinese advance man screaming and shoving us behind his ever moving red tape line,” said the report. 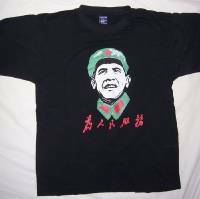 Sales of a popular t-shirt sold at stalls near the wall that show President Obama in a Mao military-style hat were temporarily banned. Ah…banned? I bet Michelle got more than one to take home. So, what can we say? Get used to it New York Times…it’s a new world and you work for them now. You have for the last decade, it’s just that now, you don’t have to hide it anymore. In the meantime, Michelle and the girls got to visit all the tourist spots at our expense. Have fun girls! I know China is boring sometimes. 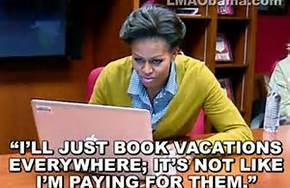 But..don’t worry…odds are dad will let you go back to Cancun before he gets out of office. Is China Just Going to MOVE Here? Some people know that Bill Clinton took the top guys of our military manufacturers over there for deals, (who since have paid fines for selling our good stuff to China) and we can assume that is still going on. Remember: Chinese were always in the Clinton White House. It’s no secret that they gave a lot of money to Bill at his morning coffee “You paid for it!” meetings there. Spies were everywhere. They even gave one Chinese guy top clearance at Los Alamos, and he took a laptop full of goodies back to China with him—- Just like Snowden. You would have thought Bill would have been screaming about that..but no…silence. 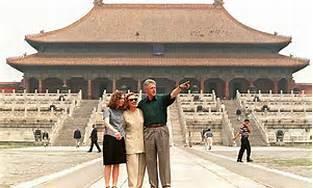 Daddy Bush was the U.S. ambassador to China. But, I don’t remember him saying a word about the country. He never talks about China. Silence. The only time I remember his son, George W. saying anything was when one of our spy planes was shot down in his first term as President, and he had a heck of a time getting those people back. Since then, silence. And he was quite nice at the big Olympics games in Beijing. Nice…and quiet. Then I got this from a friend last week: This didn’t make much of a splash in the news, but China has big plans to start moving into the United States How? 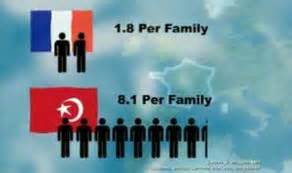 Why WE are going to help them! A Long Island businesswoman wants to build a massive “Chinese Disneyland” in the Catskills — which would include an amusement park, huge mansions and a “Forbidden City” laid out according to the principles of Feng Shui. The China City of America scheme could bring thousands of wealthy Chinese immigrants to the tiny Sullivan County town of Thompson, under a federal program that lets foreigners get visas by investing $500,000 in the US. It also projects a $65 million infusion from the U.S. government – without naming what agency would make the contribution. What a better way to spy on a country, then to build an amusement park, and bring over thousands of Chinese to “live” in it? You never read about China, but they have cost us and our companies…billions of dollars, by stealing. And spying. They are silent about it, and they’re good at it. They’re like millions of ants–they never take a big bite out of you, but with numbers, they can really leave you in a lot of pain from millions of little bitty stings. 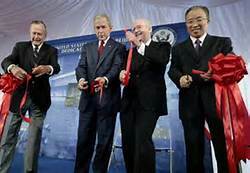 The idea of the Bush “New World Order” was to promote capitalism in China, and everywhere, and then all countries would be dependent on trade and so there would never be a war. Great idea…but—.did they ever imagine that China could do a Reagan on us? No…too many CEO’s were salivating at their people ‘numbers.’ It was just a theory. And how’s it working out? I have often expressed my worry about my Muslim neighbors, but on that same block, the Chinese are moving in. They have the money now thanks to America. They seem friendly enough, friendlier than the Muslims, but then again, I’m not sure what their plan is. 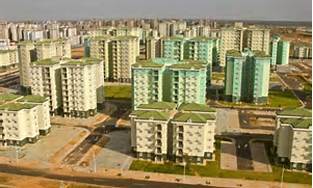 Why IS China building ghost cities all over the planet? 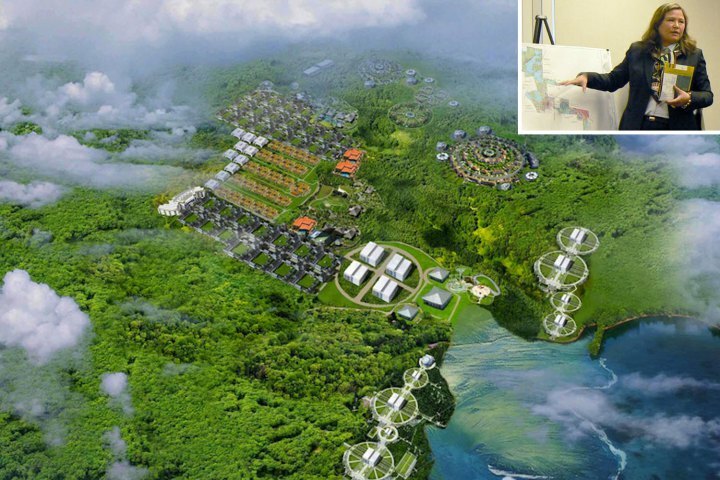 Will they get this big China Town in the Catskills of New York? Probably…anything can happen with Obama as President. But, Nobody Wins when our politicians give them money to do it. And I think, it’s time, our Presidents START talking about China. The deadly silence from them all, should make us all….wonder why…they never say anything. And why nobody in the press never, ever asks the question: What about China? Hey you tell me.. why the silence. I’m all ears. Nobody Notes: This template is called Suburbia…I have only one or two more left than I’ll quit. Promise! 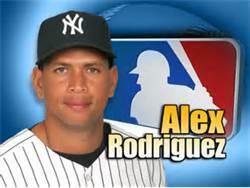 Alex Rodriguez met head-on allegations that he tested positive for steroids six years ago, telling ESPN on Monday that he did take performance-enhancing drugs while playing for the Texas Rangers during a three-year period beginning in 2001. 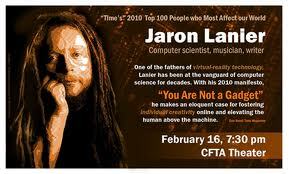 “When I arrived in Texas in 2001, I felt an enormous amount of pressure. I felt like I had all the weight of the world on top of me and I needed to perform, and perform at a high level every day,” Rodriguez told ESPN’s Peter Gammons in an exclusive interview in Miami Beach, Fla.
“Back then, [baseball] was a different culture,” Rodriguez said. “It was very loose. I was young. I was stupid. I was naive. And I wanted to prove to everyone that I was worth being one of the greatest players of all time. I’m not sure what they are going to do to him: Make him bat-boy for a year? Make him run beer errands for the Yankee fans during the home games? Make him play baseball in Cuba for a year? Go to steroid rehab? 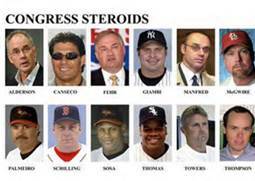 Nobody Knows, but we are finding out now, that 103 more players tested positive for steroids in 2003…and that was…uh…TEN years ago? What were they waiting for? The Cubs to win the World Series? This coming from a man who has never played anything straight in his life….he even cheated on his birth certificate…..but I digress. And then, there’s the cheaters in China. It seems, the school exams in China are so HARD that the kids have been sneaking in electronic ‘cheating’ devices, so therefore, BRAS will be banned during the tests. That ought to give those women an edge. Education chiefs in northeast China have devised a new tactic to clamp down on cheating in the country’s annual university entrance exams: they have banned bras. 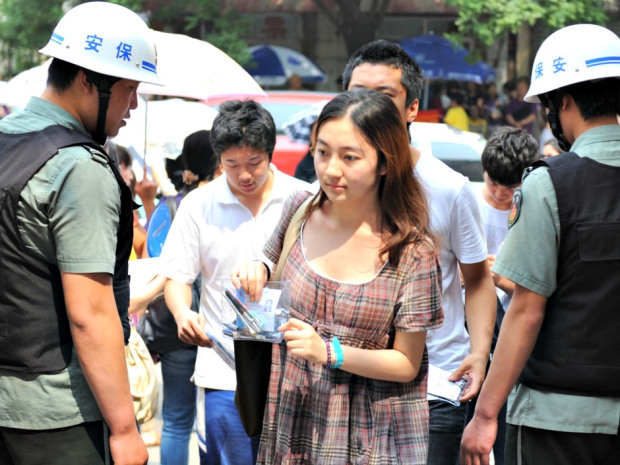 About 9.12 million students will sit the notoriously difficult gaokao exam Friday and Saturday. Last year, according to the China Daily, more than 60,000 electronic devices were seized, including plastic earphones, wireless signal receivers, modified pens, watches, glasses and leather belts. They should take a page from America: Our teachers let them bring anything at all with the answer to the test questions, because in America, the teachers don’t get their big bonuses unless the kids pass the tests. In fact, if a kid is caught NOT using a calculator in math class….and they start actually doing math in his or her own head,—they will flunk the class for not knowing how to use the all important calculator. The Chinese have it backward! Obama…Obama’s daily cheating has tarnished an entire era for the whole planet…He should be kicked out of baseball. It seems being a woman in China is more dangerous now than it ever was before the revolution. 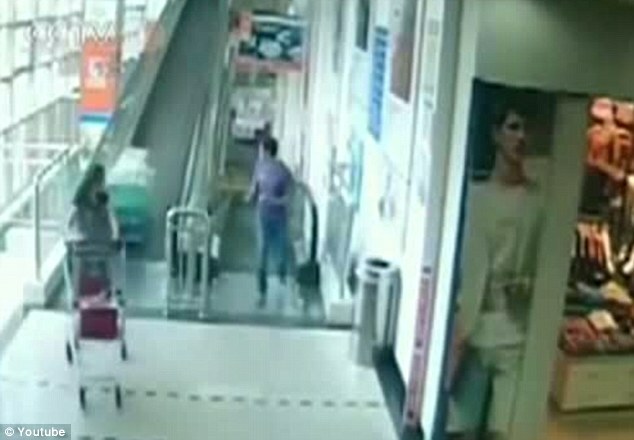 One woman was actually KILLED by a runaway shopping cart. I can relate. One time, in a local shopping parking lot, some woman tried to kill me with her car, because she wanted my boyfriend. But I outsmarted her…meaning…I ran REAL hard, and graciously gave him to her. But, this poor woman didn’t see it coming. It smashed her into a pillar and that was about it. And it’s not just the shopping carts that are attacking Chinese women. 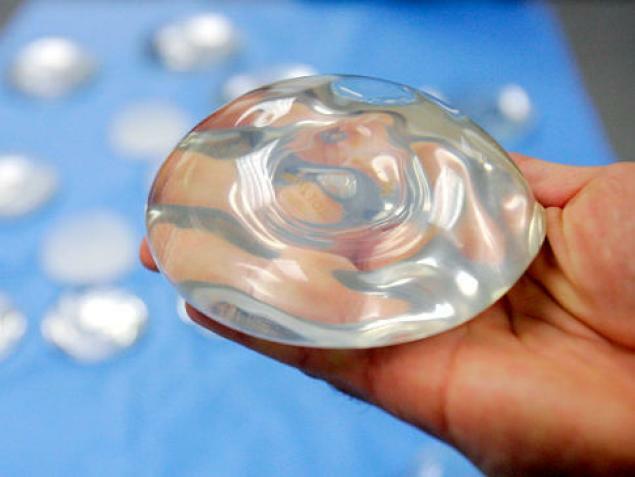 (Maybe she was an old girlfriend of Jackie Chan) Breast implants are exploding. A Chinese woman’s breast implant exploded after playing a game (Dragon Summon) on her iPhone while lying on her stomach for four hours. I’m sure her Dragon Summon score was worth the pain. But, the Chinese women, are not the only ones who are suffering. 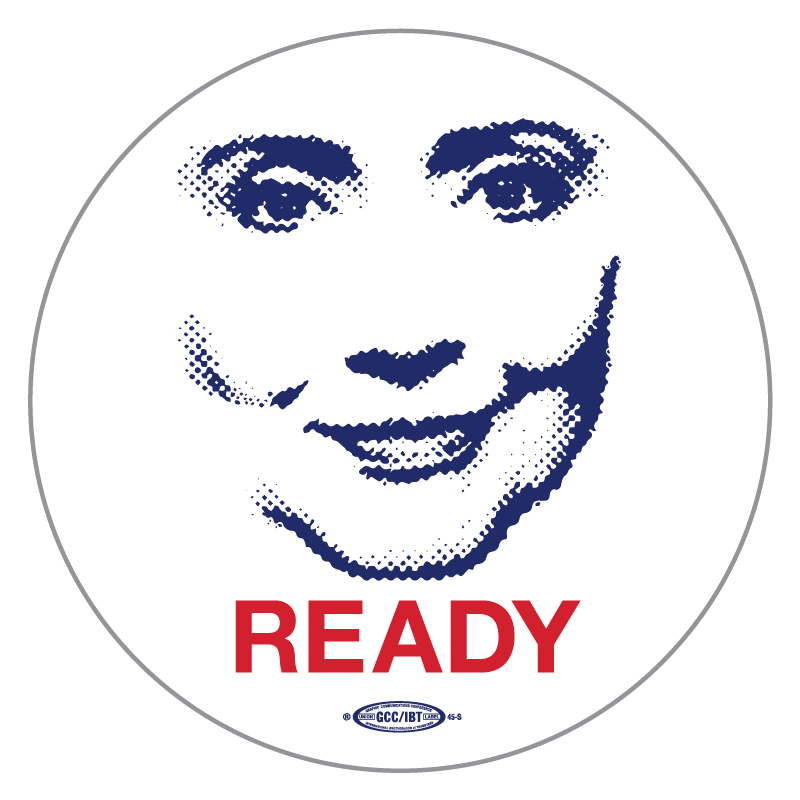 Hillary Clinton is now selling tee-shirts with her facc plastered on the front to start up her Presidential campaign for 2016. She looks like a Buddha-in-the-moon, with a serious 1984 big sister gaze. Do you think some Chinese officials would take Hillary shopping next time she goes to visit? We really are NOT ready for her. I’m just….saying. American women could use some help. Insanity: doing the same thing over and over again and expecting different results.- Albert Einstein. 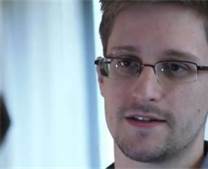 This week we have the NSA whistleblower, Edward Snowdon, VS the United States Government. Let’s start with Edward Snowden. A young man does an interview with the British paper, The Guardian, and tells the world that our government is spying on everything we do. He believes it’s wrong, and even though he knows he will be hunted down, and possibly killed, he did it anyway. After that statement, the man just disappeared. Snowden, and this is very important, allegedly downloaded the country’s most sensitive secrets, especially how the U.S. Government does surveillance abroad, so other countries would know how we spy on them. If it’s true, that’s not good, although I don’t for a minute believe that the rest of the world is that stupid, and didn’t know this anyway. Life is wonderful when you can blame some insignificant nobody, isn’t it? When it comes to protecting the secrets of the United States, I think the Democrats make Edward Snowdon look like an amateur. Take Bill Clinton. His North Korea appeasement program included a nuclear reactor. He also provided North Korea with detailed satellite photos of Kadena during the 1990’s as part of an “earth resources” deal with China. The U.S. Dept. of Commerce documents show the Chinese satellite “remote Sensing Center” was supplied with “world class remote sensing data acquisition, processing, archive and distribution” equipment. The state of the art satellite equipment was proved by Huges Corp. In 1996, President Clinton personally signed an executive order releasing a wide variety of space and missile technology for export to China. That executive order was supported by the CEO’s of Lockheed, Loral, ad Huges and it allowed China to purchase sophisticated electronic guidance and control systems for its military missiles. Remember: China helped Pakistan nuke up, and Pakistan helped North Korea, Iran and Iraq. All because Bill and his big military companies, wanted to make some money. In the meantime, he was encouraging all other nations, like Japan and India to not nuke at all. 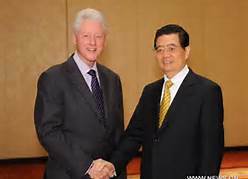 So, Bill Clinton has made it possible for China to be able to nuke the United States. Any city. Any time. 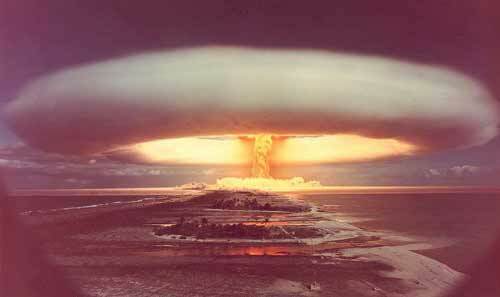 And now, North Korea. And yet, he is still adored. That was treason of the highest order. No other way to look at it: Treason. What else happened during Bill’s reign? Remember the Los Alamos fire? 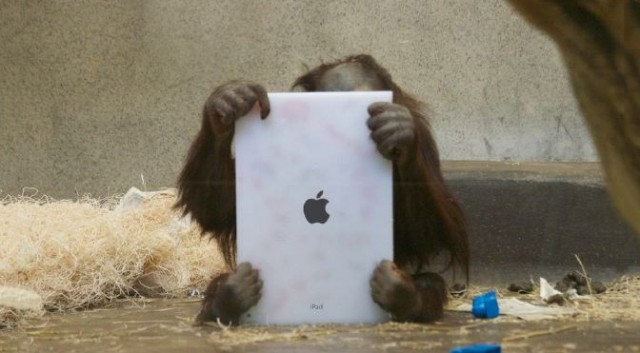 Opps, a Chinese spy got in and downloaded everything. In fact, in the last ten years that I have been reading about politics, I can’t count the number of times our secrets have been stolen. Remember when the head of the CIA was our biggest informer to Russia? Who let THAT happen? If this program is so damn good, how come we do not stop China from stealing all our good stuff? And then you have the current President, who has continued to lie. He continues to fundamentally change our now, socialist America, into a soon- to -be communist dictator. He is flooding our shores with Muslims, and his cabinet with Muslim sympathizers. He let men die in Benghazi, sent the IRS after patriotic Americans, pushed Obamacare through in the middle of the night, and that’s only what we know of. Who is the bigger monster here? Do we let him pass because we honor the office, even if it means the office is destroyed and replaced with a dictator? Is Edward Snowdow out to kill innocent Americans? Or, do you trust the government that rules you now? If you choose our government, then you are doing the same thing over and over again and expecting different results. Snowdon, might be a lone traitor, we won’t know unless we hear him speak. BUT—Our own government has hurt, and will continue to hurt more of its own citizens that Edward could ever dream of hurting. You have to buy the ‘facts’ that everyone is telling you, that he intends to give all our secrets away. And if he is a “traitor” is he any worse than a President that gave nuclear capability to China? 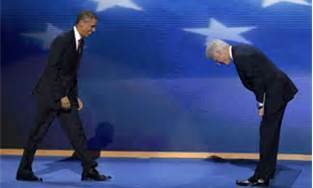 To say the Edward Snowdon is a bigger traitor than Bill Clinton or Barack Obama is insanity. And to keep trusting the criminals in office, is just more insanity. But that just my lonely Nobody Opinions. Remember when all the dogs were dying a couple of years ago from tainted dog food from China? I wonder how Glenn Beck would have reacted if his dog had died from tainted dog food instead of old age? Those of you who listened to Glenn Back last week, know what I’m talking about. Anyway, I haven’t checked this out…but I’m looking at a can of Campbell’s Chicken Noodle Soup in my hand, and the first number on the barcode is 0…so according to this information, it’s made here. Would they LIE about this? I have NO idea, but I thought it interesting enough to pass it on. Always read the labels on the foods you buy…no matter what the front of the box or package says, turn it over and read the back, carefully. With all the food and pet products now coming from China, it is best to make sure you read the label at the grocery store, and especially WalMart when buying food products. They don’t have to pass an inspection for health or contamination. Many products no longer show where they were made, only give where the distributor is located. It is important to read the bar code to track its origin. How to read Bar Codes….interesting! This may be useful to know when grocery shopping, if it’s a concern to you, it’s a great way to “Buy USA & Canada” and not from China. The whole world is concerned about China-made “black hearted goods.” Can you differentiate which one is made in Taiwan or China? 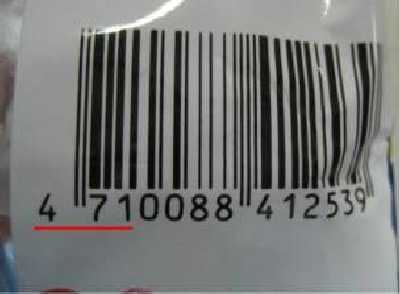 If the first 3 digits of the bar code are 690, 691, or 692, the product is Made In China. This is our right to know, but the government and related departments never educate the public, therefore we have to rescue ourselves. Nowadays the Chinese businessmen know that consumers do not prefer products “Made in China”, so they don’t show from which country it is made. 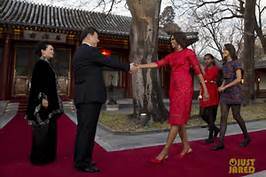 Obama Gives China…The Good Stuff! —-Why isn’t this the front page story on every news lead tonight? Because, our mainstream media, won’t touch it. Instead, we watch for Popesmoke. Popesmoke is NOT going to save any of us from Obama. Last week I posted about Obama lamenting that he wasn’t an emperor. Well, for a pittance of what he spends on himself at our expense, next time he goes to China, he could buy himself an imperial bath, and PRETEND. Why not? 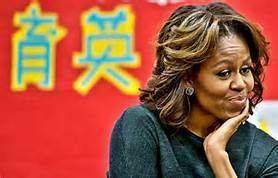 Send Michelle to Spain again. Better yet, send her and the kids to Russia to look at that big hole. I don’t know about you, but I think Obama could get used to this kind of thing. In fact, if he IS going to become our emperor, we should insist he takes a spa bath everyday for at least 6 hours. Then he will always have a good excuse for not answering the phone, should any Americans be attacked ever again. The Springs Hotel, at the Lushan Mountain County in central Henan province, China offers an imperial bath service, where one is treated like an Emperor. Recently, an unknown man from Shanxi spent over 100,000 Chinese Yuan ($16,000), for this imperial head soup service. The man was dressed up as one of China’s emperors from the country’s pre-Communist past. A group of women dressed as imperial concubines, waited on him, fed him bananas, and wine, while he bathed. If there ever was a time in American History that we all need to shout out loud that– “You WILL not take away our rights!” it’s now. Henson Ong’s speech is simply…fantastic. I got tear eyed…the truth is so rare nowadays, that when I do here it, I get…emotional.